This concise posting on The Social Organisation of Serval Cats to Serval Cats must start by saying that servals are solitary animals although occasionally they are seen together (as a mating pair) or as a family unit (mother and kittens)2. The best way to present some of this information is in a table: Home ranges, density and scent marking. Female in Ngorongoro Crater (near the Serengeti Park) Minimum home range = 9.5 square kilometres (home range: the area in which the cat lives and hunts). Density of servals generally in optimum habitat You will find one per 2.4 square kilometers. Distance servals travel daily/nightly At least 3 – 4 kilometers per night. In Ngorongoro Crater females estimated to travel 2.5 kilometers daily. Scent marking increases markedly under certain social conditions. For example, when the female is in heat (estrus or estrous) a high rate of scent marking took place for both male and female servals in captivity. See Reproduction and Development of Serval Cats. When a young male traveled through the territory of a “resident male” (a male who has found his own home range and settled there) the young male scent marked much more frequently raising the number of scent markings from 2 per hour to 10 per hour. 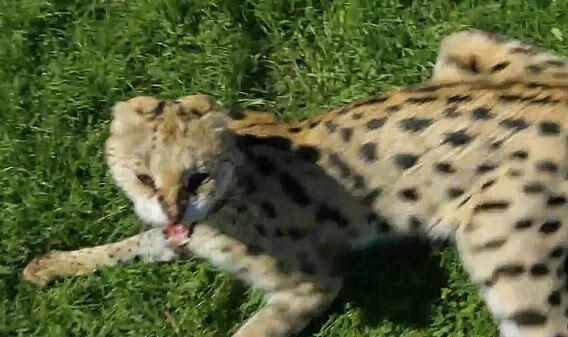 Servals also mark by scrapping the ground and leaving feces on the ground. It is unclear if, like some wildcats, servals use areas as toilets to mark territory or whether they defecate randomly. See and hear cat sounds generally. Although servals are not recognised as fierce fighters they seem to be very adept at displaying aggressive postures, which are very much inline with those of domestic cats. During stand offs with other servals, the ears are flattened against the head, almost squeezed against the head to protect them and display the white white bar/spot, which can’t be seen in the photo below (a still from a video).